After discovering an affinity with the frets and notes of a 6 string guitar, 15 year old Andrew Lim spent countless hours locked away in his room learning his instrument. With no practical training or musical theory, Andrew’s exquisite guitar work proved to be the foundation for his transcension to songwriting in his early twenties. Like pages torn from a journal, Andrew’s undisguised lyrics paint pictures of his life on a musical canvas delivering an honesty that speaks directly to your soul. Establishing himself as a noteworthy singer/songwriter in Melbourne’s music scene, Andrew earned his stripes touring nationally as the guitarist and backing vocalist for the rock group Closure In Moscow. It was his love for blues/country and pop that would later be the catalyst for Andrew bowing out of the band to further develop his songwriting and try his hand at a solo career. 2011 saw Andrew support Australian singer-songwriter sensation Michael Paynter as well as Pink’s guitarist, Justin Derrico, on his extensive national tour. With Andrew’s guitar playing firmly rooted in blues/country, he draws from its finest elements, fusing it with slick pop melodies and his incredible vocal range to bring a fresh approach to the pop/rock genre. 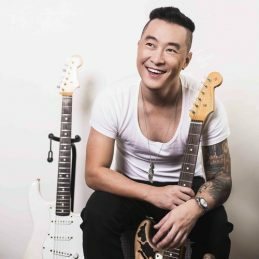 Andrew’s debut single “Closer Now” (co-produced with Jimi Maroudas – Kimbra, Eskimo Joe, Pete Murray) is slated for release early 2012 and will mark the beginning of Andrew Lim’s ascension as one of Australia’s hottest new pop/rock artisans.